The student rush policy for reasons to be pretty states that the tickets go on sale two hours prior to the performance. I arrived at the Lyceum Theatre at 5 p.m., book in hand, ready to wait an hour for tickets to be released (hoping I’d be permitted to wait in the lobby instead of under the threatening clouds). I went to the ticket window to check that there were rush tickets available for the performance and the attendant surprisingly initiated the transaction – an hour early. That’s not the policy, but I’m certainly not going to complain. I was in and out, $26.50 third row balcony seat in hand. That’s the third tier in the Lyceum, which is so high and steep that it makes my palms sweat. The seats weren’t bad, but for a play that’s been playing to 42 percent attendance for the past three weeks, I’d have thought rush seats would have been closer. However, the producers seem quite discount friendly; in addition to the student rush policy, there are show promoters around Times Square offering $35-ticket coupons to the production. In his least sinister play (by a mile), LaBute presents Greg (Thomas Sadoski), a man who has just been dumped by his girlfriend of four years because she found out he referred to her face as “regular.” Despite having – what we can presume as – some intellectual capacity (he reads works by Hawthorne and Irving on his lunch break), Greg works in a factory packing boxes. Greg isn’t doing so well. He’s a guy who we see has a lot of potential, but that’s the thing – it’s just that. But LaBute’s going to change all that. Greg’s breakup sends him down a road of thinking deeper about his feelings for other people, who he cares about, who he doesn’t, and what he’s going to do with himself. We are watching Greg’s journey to becoming a better man. It’s a nice lesson, honestly. It’s as sweet as LaBute has ever gotten (that’s right, two office hacks pretending to be in love with a blind woman just to wait for the right moment to break her heart was not sweet). But the play feels a bit light, kind of like, ‘Well, I’m happy for Greg. Really, I am. But where’s the rest?’ The problem is I didn’t see enough “bad” in Greg to begin with (or even believe it). This is not a show about body image. It’s a show about relationships and doing the right thing, inside and out of them. Greg makes mistakes in his relationship with Steph (understudied at my performance by Anne Bowles) predicated on immaturity. What reasons exemplifies is that we must not only do the right thing in a relationship, but also once they have disappeared into our past. Greg slowly starts to shed his boy skin and stand up for what he believes in. LaBute uses the character of Kent (Steven Pasquale) as a tool to change Greg. Kent is the classic LaBute man, and in a jarring scene where he takes the form of a schoolyard bully, we see the new Greg emerge. It works because sometimes it takes moments of extreme severety to change the people that have so strongly been railing against it. What better scenario to place Greg in than a scene that has played out in all of our lives. The only thing more frightening than encountering a schoolyard bully as a child is meeting one as an adult. The four person cast feels even smaller than it is, since the other three only really interact with Greg. But they do an effective job at finding the idiosynchracies of their characters. Pasquale is a first-class jerk as Kent, and the audience delights in it. Piper Perabo as Kent’s security guard wife Carly is charming and finds the humor in her role, and tenderness when needed. And Bowles is a firecracker as Steph, basking in her explitive-infested opening scene and then carrying throughout with toned-down humor. Sadoski makes Greg come to life, by being a sometimes impish nerd, but showing that he’s got real heart, if the words could only get past his barricade of a tongue. Of course at the end, Sadoski’s man-boy yeilds to a sincere gentleman beautifully. 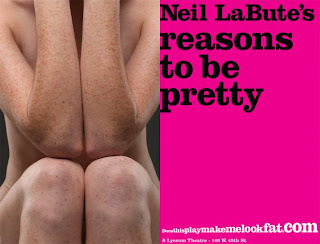 LaBute’s reasons to be pretty is a subtly sweet play, yet feels like it’s stopping short of a bigger conclusion. Since his works usually include a more devastating revelation, which has become a LaBute signature, this one comes off a tad disappointing. This gives LaBute all the more reasons to be nasty.